AtHoc is committed to the mission of empowering organizations to protect their people and the communities they care about, and ultimately making the world safer. 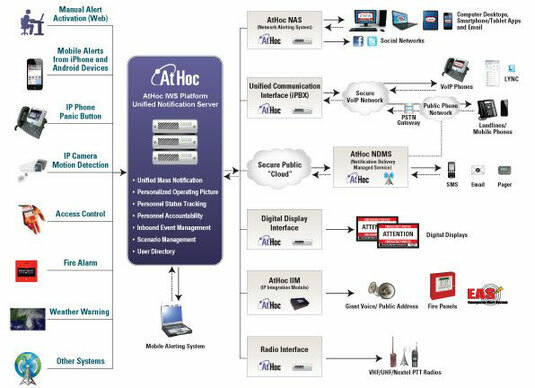 AtHoc's comprehensive suite unifies crisis communications between organizations, people, devices, and external entities. The result: Leaders can make informed decisions to effectively protect the people they care about. AtHoc provides a comprehensive crisis communication and mass notification solution that unifies all channels and devices, empowering organizations, people, and communities to communicate and collaborate during critical events. AtHoc Collect empowers your personnel in the field to be the "eyes and ears" of the operations center. It enables on-scene personnel to report events, work progress, along with rich geo-tagged media that are worth a thousand words. AtHoc Account enables real-time visibility into personnel location and status for effective crisis handling and response before, during, and after an emergency. You'll have the insights necessary to make informed decisions for dedicating resources and providing assistance where it's needed most. Personnel are able to respond with their status and provide their geo-location providing the operator the ability to create situational awareness and coordinate a targeted response. In addition, robust reporting enables your team to stay well informed and ensure continuity of operations. AtHoc Connect enables organizations to communicate and collaborate with greater effectiveness, authority, and control in times of crisis. It enables connected organizations to seamlessly communicate in real-time, resulting in faster and more coordinated responses. Work together with other organizations to protect life and property, as well as minimize the overall negative impact of an event. Every organization works to reduce the overall impact of an event and keep people safe. From Hurricane Katrina and the Washington Navy Yard shooting to recent cybersecurity incursions, major events have shown that emergencies do not occur in silos – and that real-time interoperable communication is essential for event resolution.